It's no secret Ferraris are renowned for their ability to drive women crazy. Unfortunately, a Portland dealership full of them drove one woman so insane she used her green Honda to punch a few holes in the showroom this morning. 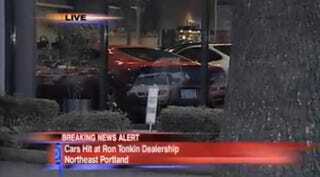 The police apprehended the woman who used her Honda to destroy the facade of Ron Tonkin Gran Turismo at a gas station and found the woman to be "incoherent," No reason was given for why she targeted this particular dealership, though she initially resisted arrest and is apparently in the hospital being evaluated. Despite all the damage to the dealership it doesn't appear any cars were harmed.